The rush for prohibition and the Supreme Court’s decision to ban liquor sales within 500 metres from highways have hurt companies. IMAGE: At around 65,000 licensed liquor shops across the country, India’s outlet penetration for spirits per 1,000 people is low, sector experts say. Photograph: Vivek Prakash/Reuters. 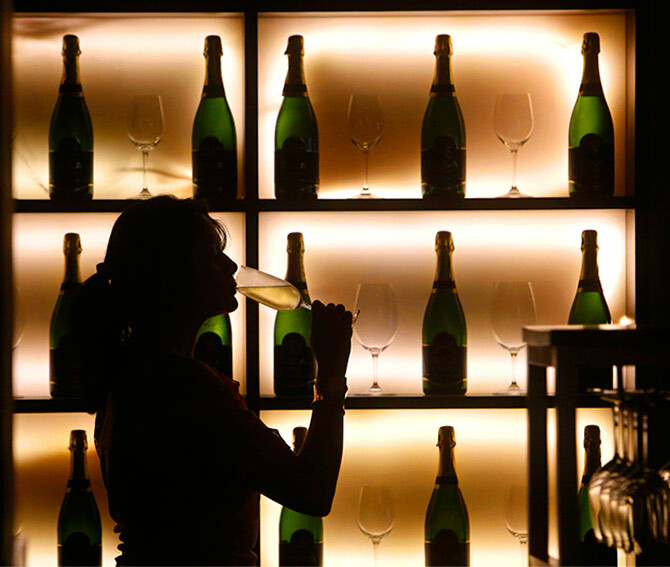 India’s move to be austere when it comes to its drinking habits seems to be driving liquor companies up a wall. After seeing its slowest growth in over a decade in 2016-17, the new fiscal appears to not hold much promise for the country’s liquor majors. The cumulative sales decline due to the ban on serving alcohol 500 metres from highways, which came into effect on April 1, as well as prohibition in states such as Bihar, is 10 per cent for the months of April and May 2017, persons in the know have told Rediff.com. The forecast is that 2017-18 will be challenging for most liquor majors as the highway ban continues. The implementation of the Goods & Services Tax is also set to disrupt the trade. “I do expect that the highway ban will continue to hurt performance for the next few quarters and the GST implementation is likely to create operational disruption at a macro level which could impact our FY18 short-term performance,” Anand Kripalu, chief executive officer, United Spirits, the country’s largest spirits maker, said recently in an investor concall. IMAGE: Madhya Pradesh, for the record, joins a list of states such as Kerala, Tamil Nadu and Bihar that have either enforced complete or partial prohibition over the past year. States such as Gujarat, Nagaland, Mizoram and the Union territory of Lakshadweep are already among India’s dry regions. 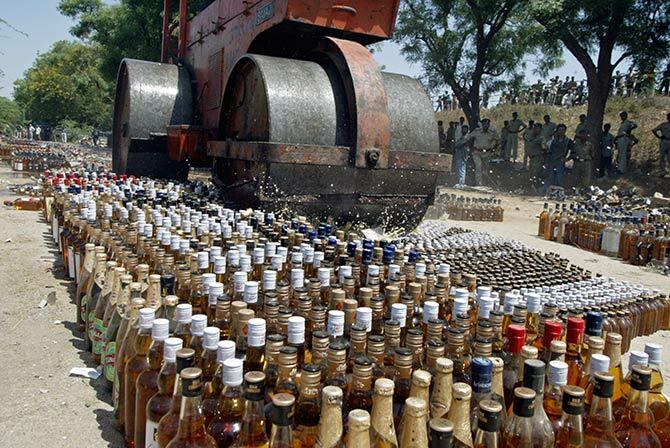 A roller crushes bottles of seized illegal liquor at Koba village, about 18 km from Ahmedabad. Photograph: Amit Dave/Reuters. Last month, French major Pernod Ricard, maker of brands such as Blender’s Pride, Royal Stag and Imperial Blue in India, had already indicated when announcing its March quarter results that the forthcoming months would be tough in view of the highway ban that has seen liquor shops and bars move away from the state and national highways. 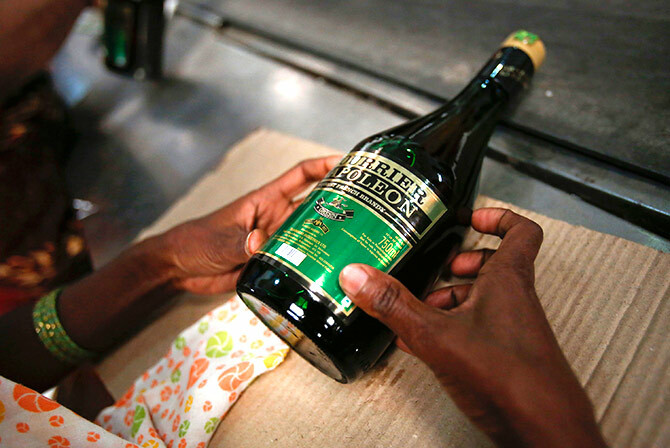 Analysts expect Pernod Ricard, which is the country’s second-largest spirits maker, and also the most profitable player in the business, to see at least two quarters of deceleration in sales growth in FY18. While states such as Maharashtra have attempted to circumvent the ban by denotifying some of their highways, Abneesh Roy, senior vice-president, research, institutional equities, Edelweiss, says there will be short-term pain. At around 65,000 licensed liquor shops across the country, India’s outlet penetration for spirits per 1,000 people is low, sector experts say. The highway ban, they say, has meant that at least 20-30 per cent of these outlets have had to shut shop for want of space in the last two months. IMAGE: The cumulative sales decline due to the ban on serving alcohol 500 metres from highways, like at this bar along the Mumbai-Nashik highway, which came into effect on April 1, as well as prohibition in states such as Bihar, is 10 per cent for the months of April and May 2017. Photograph: Vivek Prakash/Reuters. A recent Crisil report said that 25 to 30 per cent of premium hotels, which are located within 500 metres of state and national highways and serve alcohol, would be affected by the ban. The report says that hotels located in cities such as Pune, Kolkata and Agra will be most impacted thanks to their proximity to highways. 'An additional problem is the surge in competition. Hotels within cities will now pose as competition to premium (5-star) hotels on highways. The competition will not be restricted to premium-segment, but will also trickle down to the 4- star and 3-star categories,' the report said. According to industry estimates, liquor sales alone account for close to a third of the food & beverage revenues of five-star hotels. A ban then hardly augurs well for liquor majors, who depend on hotels besides retail shops for sales. 'While the Supreme Court’s judgment is undoubtedly in public interest, and aimed at dealing with road accidents caused due to drunken driving on highways, hotels (and liquor companies in the process) will face sweeping changes in the way they function,' Crisil said in its report. But the bigger worry is the threat of more regulatory action against an industry viewed as being ‘sinful’. While alcohol has not been included under GST, the concern among most players has been whether more states will do what Madhya Pradesh and Uttarakhand announced recently: banning alcohol in a phased manner. Madhya Pradesh, for the record, joins a list of states such as Kerala, Tamil Nadu and Bihar that have either enforced complete or partial prohibition over the past year. States such as Gujarat, Nagaland, Mizoram and the union territory of Lakshadweep are already among India’s dry regions. IMAGE: While alcohol has not been included under GST, the concern among most players has been whether more states will do what Madhya Pradesh and Uttarakhand announced recently: banning alcohol in a phased manner. 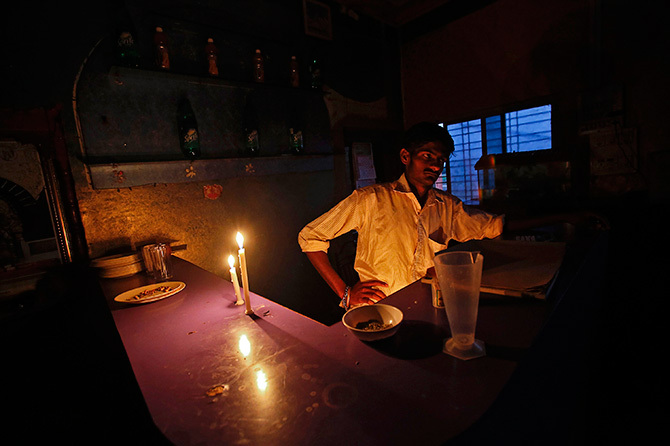 Photograph: Vivek Prakash/Reuters. “The worry of prohibition is always there, especially when states are going to the polls. To me, these measures are nothing but political moves,” says the chief executive of a top liquor company. “By doing this, what you encourage is bootlegging, which hardly serves the purpose of social reform. Not to mention the loss of revenue to the state,” he adds. Liquor in India is a state subject, contributing 25 to 40 per cent in terms of revenue to the state exchequer. In the last few years, states such as Karnataka and Maharashtra have slapped higher taxes on alcohol in a bid to improve revenues. The move to keep alcohol out of GST, say experts, is partly linked to state governments’ needs to ensure their revenues are not impacted because of a uniform GST rate. With the growing threat of prohibition, increased taxation and regulatory action, the 330-million-case domestic liquor market is witnessing a decline.